RunDND is a feature documentary about New York City's first African-American mayor, sponsored by One Centre Street Syndicate, a 501(c)(3) tax-exempt non-profit organization. Our mission is to educate the general public regarding the life and accomplishments of David N. Dinkins. Scores of Dinkins alumni from the Manhattan Borough President’s Office and from the administration of New York City’s 106th mayor joined friends and colleagues at Bettalona restaurant on Broadway in Manhattan on March 6. The venue, easily reachable on the #1 train from the 125th Street station appropriately borders the “village of Harlem,” as Mayor Dinkins refers to his former neighborhood. 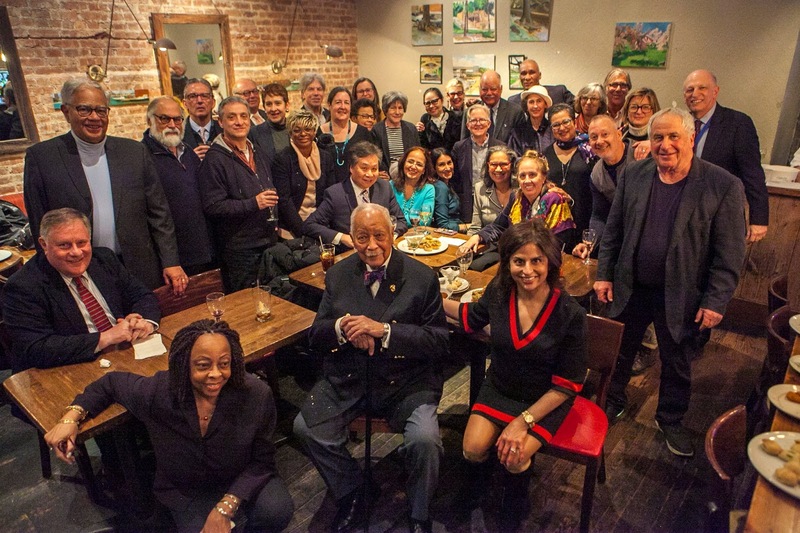 Mayor Dinkins, ever dapper in a double-breasted suit and bow tie, greeted his former staffers and colleagues as guests mingled and toasted over wine and Italian fare. Attendees included former First Deputy Mayor Norman Steisel, former Deputy Mayor Sally Hernandez-Pinero, former Deputy Mayor Cesar Perales, former Finance Commissioner Carol O'Cleireacain, former Chief of Staff Ken Sunshine, Manhattan Borough President Gale Brewer, David Jones, President of the Community Service Society and two of the “Policy Gals” from the Manhattan Borough President’s Office, Barbara Turk and Nancy Wackstein, both of whom went on to serve in the administration and many members of the Dinkins team. Faye Perry, a former assistant to Bill Lynch paid homage to colleagues and friends who are no longer with us including Bill Lynch, Jerry Saunders, Amina Abdur-Rahman and Diane Morales and expressed gratitude to Mayor Dinkins for his contributions and for bringing this extraordinary team together.